I've been working with an engineer at KARI (Korean Aerospace Research Institute - the Korean space agency) on an addon simulating the Korean Lunar Orbiter mission concept in celestia.Sci. KARI has just begun developing a lunar orbiter and has set a goal of 2018 for launching it on a US launch vehicle (originally the plan was to launch on Korea's next gen launch vehicle KSLV-2, but budget cuts this year make that unlikely). The orbiter will be followed up by a surface rover. In the .ssc, I then linked all the components together using BodyFixed frame directives. I had to use the Spice orbits for the Earth and Moon, by following the instructions given in the CM Spice Kernel Files forum. There are some differences between the default orbits and Spice ones that prevent the .xyz trajectory from lining up with the default orbits. After testing again, the default orbit does provide a good match for the .xyz trajectory, so there is no need to use the Spice orbits! I must have mixed up something when testing previously. This is the orbiter in the dark side of the Moon. Eclipse shadows on the spacecraft are handled correctly. The spacecraft follows a roughly polar lunar orbit, coming as close as about 100 km from the lunar surface. 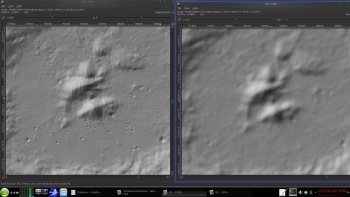 I used JVV's LRO WAC map and the LOLA normal map from here. 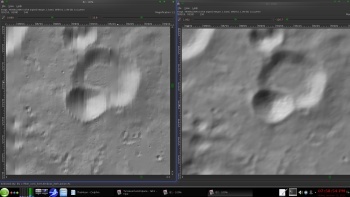 Planetographic grid has been turned on to show lunar longitude and latitude. I noticed that with the provided trajectory .xyz file, the spacecraft would periodically speed up, slow down, then speed up again, etc. It seems that the time (first column) was not written with sufficient number of decimal places, causing several rows to have the same time. So I tried to simply delete any rows with duplicated times. But this didn't work, because it caused the distance between the same timestamps to vary. In the above example, deleting duplicate .207 and .209 entries would cause the distance to jump suddenly between .207 and .208, and .209 to .21. Since velocity=distance/time, this causes the velocity to jump suddenly also. The solution was to recalculate all the timestamps. I simply took the total time interval between the first row of the .xyz file and the last row, and divided by the total number of .xyz entries minus 1. Then I made all the timestamps increment by this constant time interval. As you can see, there are no more gaps and moreover the velocity curve is smooth. The motion of the spacecraft in celestia.Sci is also much smoother. However, the velocities are also higher than the original; I'm still investigating why. I think that the smoothed velocities are correct (i.e., the unsmoothed velocities with gaps are wrong). For the unsmoothed profile, the velocity evens out at only ~5.5 km/s, and the delta-v of TLI is only about +2 km/s. These numbers are too small, especially considering that a typical orbital velocity of a circular LEO should be ~8 km/s. By comparison, the smoothed profile flattens out at ~7.8 km/s, which is a reasonable velocity for LEO. Also, TLI delta-v is roughly +3 km/s, which is also in the ballpark for typical TLI delta-v's. 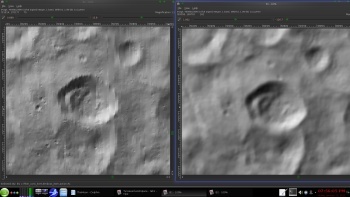 While preparing this mission concept, I also took the opportunity to generate a fresh 32k normal map of the Moon using the latest 2014 LOLA data. A previous version from 2011 is available from http://imbrium.mit.edu/EXTRAS/CELESTIA/ and also the Motherlode. Then I used Fridger's nmtools to generate a DXT5nm virtual texture. I took the opportunity to compile nmtools again for the Mac in order to try out nmtilesDXT (a nmtools program that generates DXT5nm tiles). This worked, although I had to change the Makefile and also compile NVIDIA texture tools from scratch. As you can see, there is a clear improvement in quality in the 2014 data. Details are sharper, and there are less artifacts as compared to the 2011 data. It goes without saying that the DXT5nm compressed format also saves disk space: 589 MB vs 946 MB for the 2011 version (which uses PNG). looking pretty good from what is visible above! Where on Earth is Dirkpitt? So no surprise that you needed to recompile the latest 2.0pre2 versions on your MAC in 2015 . For the current versions, I only was able to provide binaries for Win 7 and Linux. The 2.0x versions run a factor of 2 faster than the earlier 1.0x versions, which is very convenient for tiling monster textures...and the like. Actually, some years ago I did a lot of work about a 16k colored version of the Moon using the Chang'e 2 surface texture and hand-fitted LRO-Lola normalmaps. In there, I have also discussed pros and cons about the surface and normalmap textures available then. PS: After the recent CM upgrade only Browser Fullscreen (F11 toggle for FireFox) seem to work for "kingsize" displays. Please look at the images with F11 fullscreen whenever possible. Unfortunately, the text width has turned much too large after the phpBB upgrade (due to the large image sizes). The standard add-on managing all this does unfortunately not work anymore. If I find a little time, I might redisplay the images in form of size-adaptable "attachments"! But that is rather time consuming. After testing again, the default orbit does provide a good match for the .xyz trajectory, so there is no need to use the Spice orbits! I must have mixed up something when testing previously. You have more locations displaying in that screenshot than me. Which addon are you using to display all those extra locations? 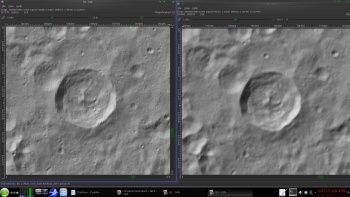 I'm also aware that the LRO WAC color texture (I'm using JohnVV's version) has some shading issues. Yet even in the Chang'e 2 map, there is some (perhaps inevitable?) shadowing towards the polar regions (I'm referring to viewtopic.php?f=6&t=428). But the Chang'e coloring is definitely an improvement vs LRO WAC. Would you be able to offer this as a download? Also what Specular color and power settings are you using? You should definitely try the 2014 version of the LRO LOLA data. The quality is visibly improved. 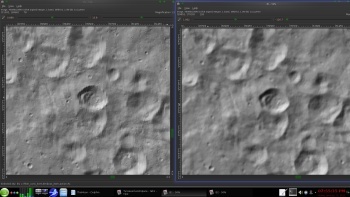 Just be careful that LDEM_128.IMG starts from longitude 180 deg, meaning that after conversion with nmtools I had to shift around tile filenames to match celestia.Sci's expectation that the data start from 0 deg. in the bottom-left image for example, finer surface details are clearly visible, yet there are these vertical stripes. On the other hand it is no problem whatsoever to get rid of these using the appropriate ISIS3 routine. Here is an animated thruster exhaust experiment. This is done entirely using a sprite cmod and transparent particle texture, and Lua ScriptedOrbit for particle trajectories. The plume consists of 500 particles. Frame rate is just above 20 fps. Thanks to Martin (Cham) for his Tintin rocket exhaust sample, on which this is based! The (unrealistic!) sound effect was added at the request of the KARI engineer. In fact the sound is played in realtime from a ScriptedRotation script using os.execute() to run a sound playing program (the builtin afplay command on OS X). I also made a VBScript that will do the same on Windows, by loading WMPlayer.ocx. after a long, quiet time I am saying hello again. This KARI designation just jolted me a bit, because I am currently working (real life) on another project of them the GK2. Nothing really exciting like a designer or structural engineer mind you, I am just a paper checker (quality assurance). Keep up the exciting work. That's great to hear! I'm not very familiar with the Geo-Kompsat 2 program, but it looks like their launches could happen at around the same time (2018? 2019?) as the Korean lunar pathfinder mission.